The British machinery/engineering sector has performed quite well in 2017 and in early 2018, mainly driven by domestic demand. Higher orders have led to increased work backlogs, and buyers from the manufacturing sector have expanded capacity, leading to an improved capital spending environment. 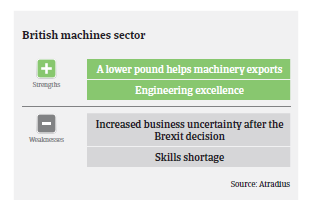 Export-oriented British machinery businesses have benefitted from the weakness of the GBP following the Brexit decision in June 2016, recording higher demand and activity. However, at the same time price pressures have remained elevated due to increased import costs for commodities. UK economic growth has started to slow down in H1 of 2018, as Brexit uncertainty continues to weigh on business investment. Additionally a tighter fiscal stance and higher interest rates will drag on growth. It is expected that the bulk of British machinery businesses, whose revenue is generated mainly in the domestic market, will be impacted by slower economic growth and lower capital investments in 2019. 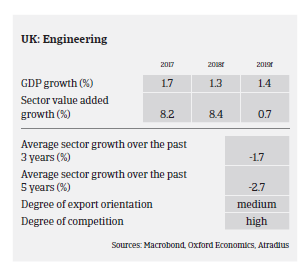 UK engineering value added growth is forecast to slow down to 0.7% next year. In the machinery for manufacturing segment the economic uncertainty caused by Brexit should not have too much of an impact. The domestic market is reasonably stable and should remain so over the next 12 to 18 months. Construction-related machinery businesses benefit from continued stable performance of the building industry, with increases in activity in the repair and maintenance markets as consumers refurbish their own property. However, lower business confidence and fewer investments could affect the building industry, while the collapse of the large construction company Carillion earlier this year has already translated into more construction business insolvencies. Many machinery businesses exposed to the oil and gas industry reported losses in 2016 and 2017 and have subsequently restructured or downsized in order to offset falling activity and investment. However, with the recovery of oil prices machinery investment has increased again, albeit slowly, having a positive impact on the supply chain for the time being. Whether there is a soft or hard Brexit will determine the effect on agriculture and food sectors and ultimately on the agricultural machinery segment (the agricultural sector is currently strongly subsidized by EU-funds). Ultimately, the profitability of individual machinery businesses depends very much on their engineering expertise, efficient production and access to funding. Furthermore, it is heavily influenced by the activity and health of the end markets they supply, such as retail, food and agriculture, construction, oil and gas exploration and power generation. Overall profit margins have remained fairly stable in H1 of 2018. 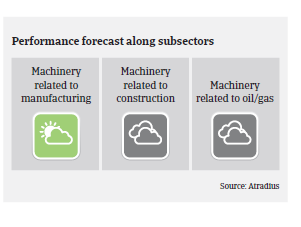 However, in line with the more sluggish sector growth outlook we expect that profit margins of machinery businesses will decrease over the coming 12 months. That said, while access to funding is certainly key for this capital-intensive sector, obtaining bank loans and tapping into the capital market is currently not an issue for the majority of machinery companies. Payments in the British machinery sector take about 90 days on average. Payment experience has been good over the past two years, and payment delays are not expected to increase sharply in the coming months. However, as UK business insolvencies are forecast to increase 3% in 2019 the machinery sector is expected to follow this trend, with businesses related to oil and gas exploration, construction and agricultural markets mainly exposed. For the time being, our underwriting stance remains generally open to neutral for the machinery sector. Given the many different players, manufacturing a diverse range of products for a variety of end sectors, our underwriting approach is very much on a case-by case-basis. We closely monitor the ongoing Brexit negotiation process and the consequences for the British economy, as the machinery sector is heavily reliant on the domestic market. While the true implications of Brexit still remains to be seen, any sharp increase in economic uncertainty, accompanied by deteriorating fixed capital investment and tighter access to funding, would severely affect the industry. On those segments more affected by Brexit (like agriculture-related machinery) we will seek additional information and discuss with buyers their plans for coping with leaving the European Union in 2019.